Hello everyone, today I wanted to share with you a brief introduction to Design Dye Natural Prints. 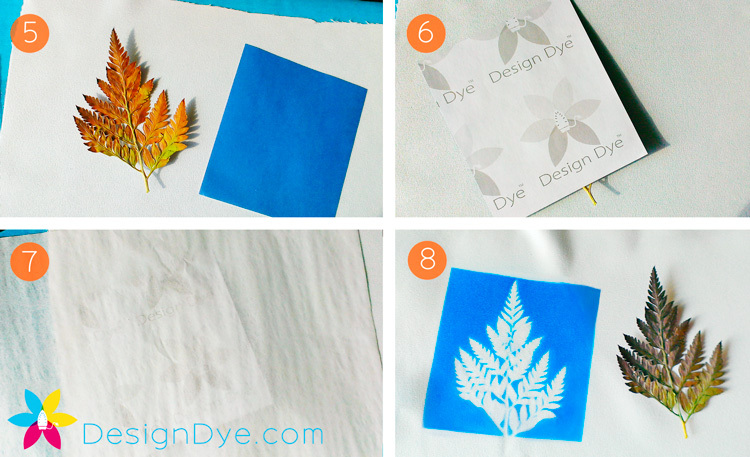 Using leaves from your garden, flowers, feathers, bark and whole number of natural materials, you can create some really cool prints to put onto fabric and other items with Design Dye. Here I'm going to show you the basic techniques with this fern leaf.
. Here is a fern leaf I picked from the yard. Now it's fresh so we're going to go ahead and dry it with the iron so we can use it for our print. 2. So between a couple of sheets of newsprint, or newspaper... 3. I'm going to iron the leaf to flatten it out and pull out all the moisture. 4. Dried leaf.
. That same leaf is now turned with the blue side down on to the fabric. 10. Put on a sheet of protective ironing tissue and iron just the leaf for 30 to 35 seconds. And there you go. The dye from the leaf is now in the fabric. This process works with all types of natural items. This could be done on a t shirt, a napkin, a table cloth, a pillow case, the list goes on and on. Check back with us for other great Design Dye ideas, and click here to check out the Design Dye Basic Fabric Kit to pick up Design Dye for your next project.